For the second weekend in a row I was able to have two very fun horse days. I know, it’s odd that it hasn’t rained 10″+ for like two whole weeks. Miracles never cease. Don’t worry, it’s gonna rain Thurs-Sat this week to make up for it. 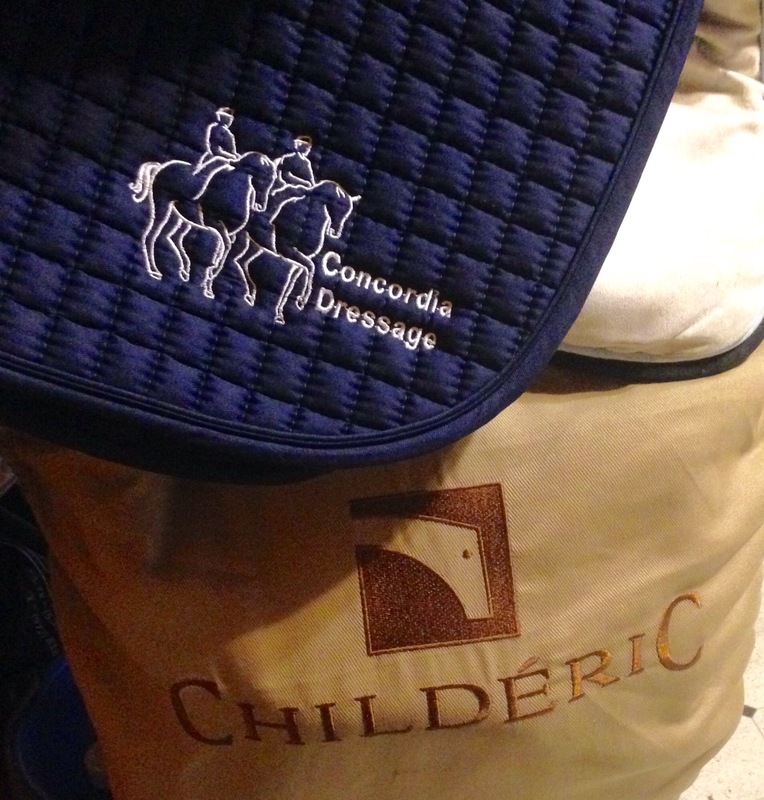 On Saturday Bobby and I loaded up the boys and made the short journey to our dressage trainer’s barn for a lesson. We haven’t had a dressage lesson since… oh… August? and there was a pretty impressive 30mph wind that accompanied a cold front. I thought I might die but Henry was actually pretty good. His brain hurt by the end (“Haunches WHERE? But I just figured out how to put my shoulders there! Make up your mind!”) but he tried, and he wasn’t a total idiot even with the whole roof and barn rattling. We’ll call that a win. 1) don’t put sticky spray (even just a tiny bit) on your saddle and then put the new fleece lined saddle cover on it. Saddle will come out looking like it mated with a sheep, and it will take 10 minutes to defuzz it. 2) Baby powder is magic. My saddle has had the most annoying squeak coming from the bottom of the panel since I bought it. It’s been years since I had anything squeaky so it took a few weeks for me to remember the baby powder trick. I turned her upside down, doused her with baby powder in all of her cracks, shook the crap out of her to settle it deep in there, and voila, no more squeak. Magic. On Sunday Bobby and I loaded the boys in the trailer again, and this time headed out to Pine Hill to XC school. It was just an informal school with the two of us bumming around and having fun. I jumped a couple of Training fences and Henry was great, but I mostly schooled ditches and the bank at the water. 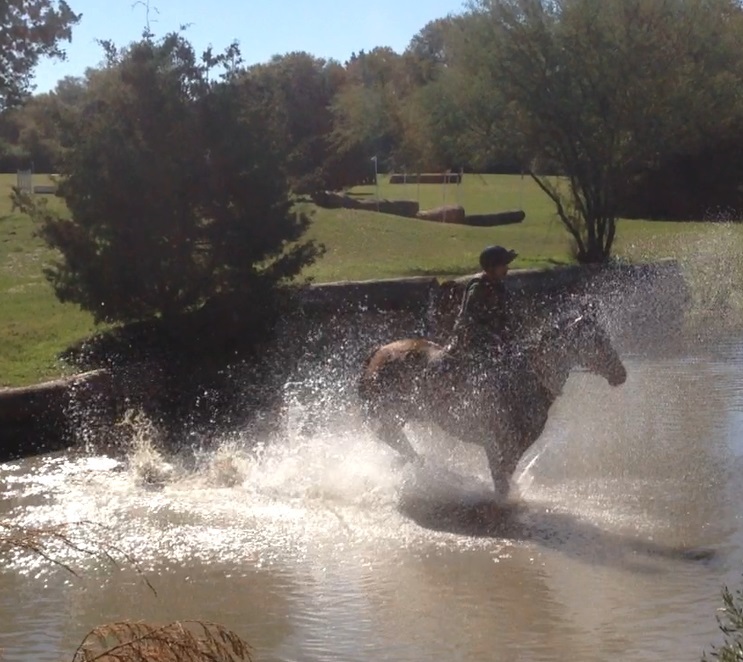 It was his first time jumping a bank down into water and a bank up out of water, which he was also really good about. Nothing particularly exciting but it was fun anyway, because XC is always fun. Today the vet is coming back out to do lots of diagnostics to see if we can pinpoint that weird stabby thing that I still sometimes feel in the canter and the sometimes swapping out behind as he leaves the ground. Nothing like trying to find the cause of something very slight that you only feel when the horse has had a few days off. I suspect a hint of stifle arthritis but we’ll see. This all just sounds like cha-ching cha-ching to my bank account. That’s ok though. I’d rather try to figure it out now when it’s still no big deal than wait until it’s a problem. Love to live vicariously through you! Nice workout for you both this weekend!! Looks and sounds like success both days! Here’s to figuring out what’s going on!! I’m like you, would rather address something small then big. 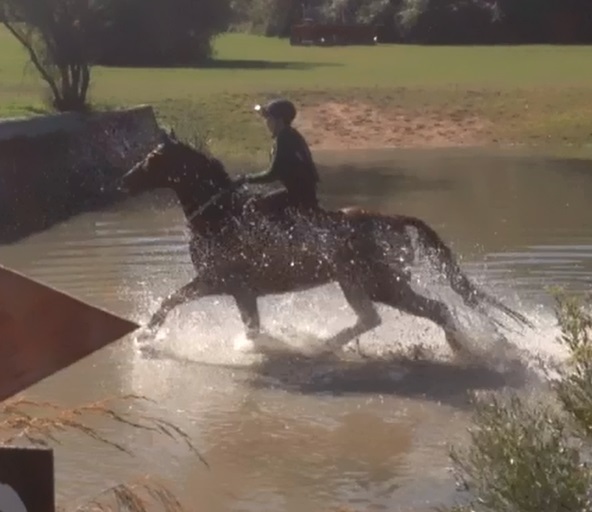 His trot thru that water is so cute. Riding on Saturday in that wind was possibly the stupidest thing I have ever done.